A man who crashed his sport utility vehicle into a back yard while not wearing any clothes was arrested after the homeowners found him in their house – and then mugged for his mug shot. 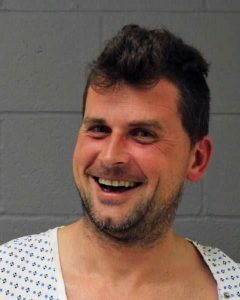 The driver, 35, of Watertown, Connecticut, offered a winning smile with his head cocked slightly to the right while sporting a johnny hospital gown when police took his picture at the police station in Newtown, Connecticut, where the incident took place. Around 8 a.m. Saturday, April 13, the usual occupants of the house got home from shopping to find a naked man they didn’t know inside, police said, according to the Connecticut Post. The sliding glass door in the rear of the house was unlocked, providing easy entry. The homeowners called the cops. Police said they were able to find his clothes after the crash. Alcohol and/or drugs are believed to be a factor, a police spokesman said, according to the Connecticut Post.